New Alumni Association President Mark Surchin during a recent visit to campus, just before a run around the peripheral road. 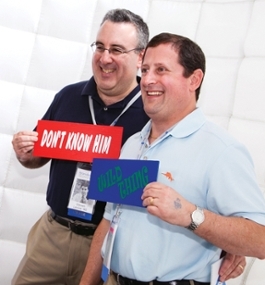 On July 1, Mark Surchin ’78 succeeded Adam Rifkin ’97 as president of the Brandeis Alumni Association. A Montreal native who has lived most of his adult life in Toronto, Surchin is the first Canadian to lead the organization that represents the university’s increasingly international alumni body. He founded the Alumni Club of Toronto in 2000 and has served on the Alumni Association board of directors since joining as a vice president in 2007. He helped establish the Brandeis-Canada Endowed Scholarship to support Canadian students and raise Brandeis’ profile north of the border. A fitness enthusiast, Surchin runs three to four times a week and has completed a marathon and a dozen half-marathons since suffering a serious heart attack at age 43. Surchin is a partner at Goodmans, one of Canada’s leading law firms. He and his wife, Kim, have two daughters, Carly and Allie. 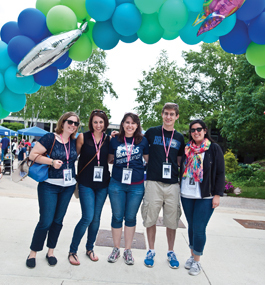 How did your experiences as a Brandeis student lead you to stay engaged with the university? 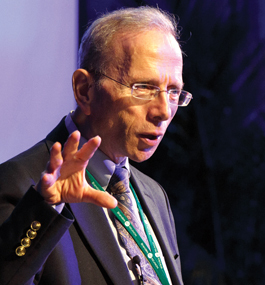 I am one of those people who had the arc of his life altered by my Brandeis education. I discovered the appeal of ideas and intellectual engagement, and learned about different ways of looking at the world. That led me into a very different career than I would have had had I not gone to Brandeis. What are your goals as Alumni Association president? Our alumni feel they received the best education possible, but they also perceive that Brandeis doesn’t offer them the same lifelong benefits that alumni at older schools get. I want alumni to know that Brandeis continues to deliver a top-tier education and that opportunities for lifelong learning, networking, mentorship and affiliation with others who share the same interests exist. I also want to make sure that the alumni voice is heard by the university’s senior administration and that the needs of our diverse alumni body are met. I hope to build on the strong foundation established by my predecessor, Adam Rifkin, whose extraordinary leadership helped the Alumni Association reach new heights over the past four years. How has your life changed since your near-fatal health scare in June 2000? My heart attack, which resulted in cardiac arrest, was a transformative event, and prompted me to reassess everything in my life and change my perspective. 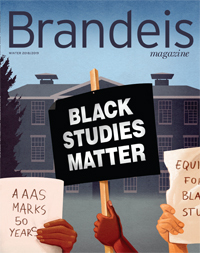 It led to a more balanced life that involved meaningfully giving back to what was important to me, including Brandeis. My first volunteer commitment after my cardiac event was attending an Alumni Association board meeting on campus. It was a vital part of my healing process. From left: Casady, Daniels, Light, Merrill, Peréz and Rueven. Six new members-at-large have joined the Alumni Association board of directors, elected to two-year terms that began on July 1. Two other at-large members — Mindy Schneider ’75 and Janna B. Rosenberg ’02 — were re-elected to two-year terms. Casady is currently pursuing an MBA at the Heller School for Social Policy and Management, where she serves as the liaison between MBA students and faculty. After receiving a bachelor’s degree in economics from Brandeis, Casady worked in asset management in New York City and Boston for JPMorgan Chase and John Hancock. She is an active Brandeisian, leading and attending young-alumni events, helping students with their interviewing skills through the Hiatt Career Center, and speaking about volunteering and life after graduation to Waltham Group students. A senior partner at Budd Larner, one of New Jersey’s pre-eminent law firms, Daniels represents banks, investors and private-equity firms as they acquire or sell various loan portfolios, and assists clients with restructuring, workouts and fore­closures. 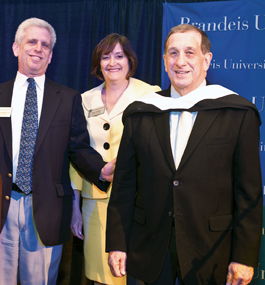 Daniels is a longtime Brandeis supporter and the founding donor of a scholarship in memory of Jordy Goldman ’76. He lives in New York City with his wife, Cheryl Lambert, who served on the Brandeis Arts Council. They have two sons, Ben and Sam. Light, who graduated with honors in computer science, is an executive director at JPMorgan Chase. 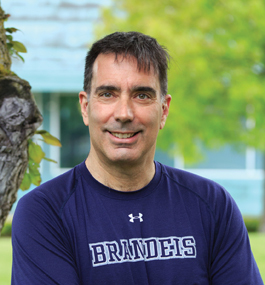 For more than 15 years, he has conducted interviews for the Alumni Admissions Council, helping to attract the best and brightest students to Brandeis. In his spare time, he enjoys bicycling around New York City. Light lives in Manhattan with his wife, Risa Rosenthal, and is the father of two boys, Daniel and Michael. A member of the Brandeis Arts Council, Merrill is a prolific playwright. As an undergraduate, Merrill transferred to Brandeis from Pembroke College (Brown University). After graduation, she worked as a community organizer and was a nurse at Boston-area hospitals and health centers. She earned an MFA in creative writing from Emerson College in 1993. 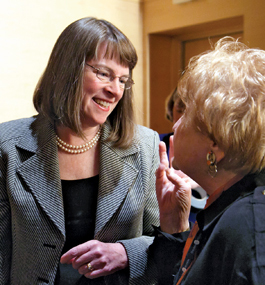 She was an English instructor in the Myra Kraft Transitional Year Program at Brandeis for five years, then held jobs at the Urban College of Boston and Middle Tennessee State University. From 2001-15, Merrill was a professor in the Liberal Arts Department at the Berklee College of Music. She has two adult children and five grandchildren. Pérez is a principal at Butler Perez Associates, a consulting firm specializing in real estate development, government relations and strategic planning. The former assistant secretary of economic affairs in Massachusetts, he has more than 35 years of experience in the private, government and nonprofit sectors, focusing on community revitalization, economic development, issues related to Hispanics, employment and education. 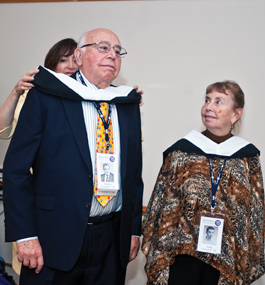 Pérez helped establish the Joseph D. Warren, Heller MSW’72, PhD’83, Endowed Scholarship, which provides support to Brandeis students who are the first in their family to attend college. He and his wife, Tonia, have four children. Rueven works as a registered dietitian and nutritionist at the mobile app Rise, where she provides one-on-one counseling. She also works at Preconceive, a startup that offers pre- and postnatal group education classes, where she produces Web content and conducts private counseling sessions. She earned a master’s degree in clinical nutrition and dietetics from NYU. 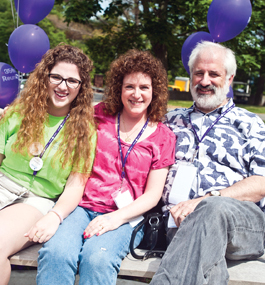 The board chair of Slingshot, a Jewish nonprofit organization, Rueven serves as a Brandeis class agent and co-chaired her 5th Reunion. She lives in New York City with her husband, Dan ’09, and her French bulldog, Stella. 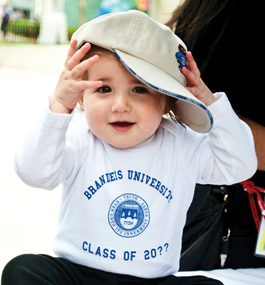 >> For more information about the Alumni Association and its leadership, visit alumni.brandeis.edu. 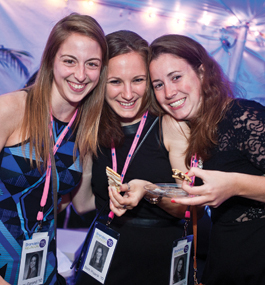 Jess Girard, Beth Pisarik and Julia Alpaio, all '10, are all smiles at the Fire and 'Deis Gala. Alumni from around the world returned to Brandeis for Reunion 2015, relishing the opportunity to visit with old friends, reminisce about their days as students and reflect on a college experience that changed their lives forever. 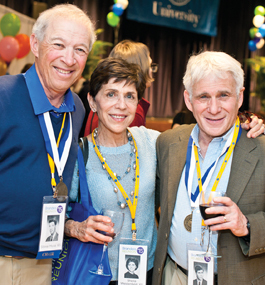 From June 5-7, more than 1,200 alumni and their guests filled the Brandeis campus with nostalgia and excitement during the turn-back-the-clock gathering, at which attendees, for a change, didn’t have to act their age. 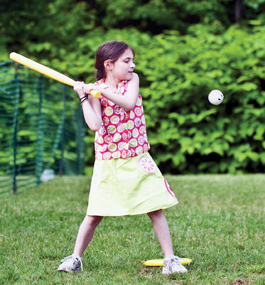 The full schedule of activities allowed for plenty of fun, schmoozing and learning. The 12 Reunion classes — 1955, 1960, 1965, 1970, 1975, 1980, 1985, 1990, 1995, 2000, 2005 and 2010 — also raised more than $6 million to support the university. “I heard from many alumni that this was the best Reunion they had ever attended,” says Patsy Fisher, vice president of alumni relations. “Emotions of pride and nostalgia were running high. Alumni told me they enjoyed seeing classmates and friends, showing their families around campus, and meeting today’s Brandeis students.